Just what the hell am I doing, firstly listening to the literary opinions of a bus-owning former DJ who lives in Hull, and secondly buying books written by poets not filled with poetry but rather wistful elegies to the abandoned margins of the urban landscape? Ten points to the ghost at the back who shouted "drinking!" It may have been indirectly drink-related: I might have been planning to drink and read and get misty-eyed and soulful. It may have been directly drink-related: it's possible I'd been sneaking Bombay Sapphire from Mrs MightyBuch's supplies, leading to guilty internet purchases of e-books I would then never read. It may have had nothing to do with drink, being rather a part of a larger movement towards appreciating the opinions of friends, sharing interests instead of deriding them, seeing what they see and feeling more engaged and compassionate and becoming a better friend as a result, a desire fuelled by disengagement and disenfranchisement brought about by the slow attrition of dreams and leakage of erstwhile potential via the quotidian pressures of life and of the perfidious self. Ten more points to the phantom heckler with more shouts of "drinking!" No, no drink was involved, and the truth, whilst irritatingly verbose to deflect attention from the deeper message therein, lies in the third way. I'm looking to improve myself (!) reading something beautifully written, intellectually stimulating and also piquant with nostalgia, articulating dimly remembered childhood experiences in prose which I am simply not able to use. Of course, this drive, like all drives to self improvement, didn't last very long - reference my most recent reading choices following this; more mental chewing gum and rampant escapism - but it lasted through a particularly enjoyable camping trip where reading this was not only hugely enhanced by liberal application of Guinness and Pembrokeshire artisan beers but which also when read aloud helped put my three year old to sleep when all he wanted to do was run around shouting 'bum' in his undercrackers. The premise, in case you're still reading, is, clumsily put, this: that on the edges of our cities and towns are spaces where different rules apply, places through which you travel but rarely stop to visit, places inhabited by the ghosts of childhood imagination, curious beauty, random and incongruous landscapes. 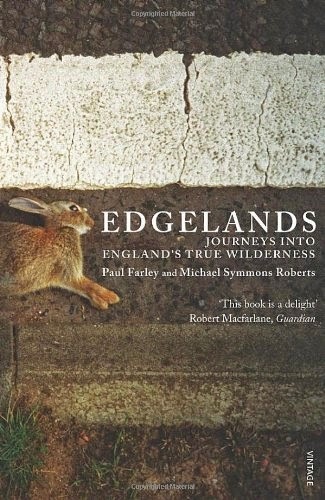 As denizens of Lancashire, lots of their experiences are centred on the north east of England, but the descriptions are instantly recognisable, indicative of the ubiquitousness of these 'edge lands', and they take the time, as advised by W. H. Davies, Super-tramp, to stop and stare, but also to record. And the record is important because, like poetry, what they capture is elusive, ephemeral, inconstant. It is always shifting, altering subtly and not-so-subtly, and for two poets to observe and reflect on it all is in retrospect a perfectly logical action. Of course, being as I am easily influenced by anything even slightly persuasive, you might wish to make up your own minds. Well, take my advice (and that of the Nottingham Forest supporting mouthpiece), and do make up your own mind. These two chaps could make you love the Manchester Ship Canal as much as they do.